These three discs from the label CRD explore mediaeval music. The first focuses on songs and dances, the second takes music from Spring and Summer festivals, and the third depicts the cries and ballads of London. The booklet notes are on the very brief side, especially for the first two discs. For instance, Medieval Songs and Dances has no actual work notes, just song texts and an introductory note on the music in general (there are also no recording dates). On the other hand, this single introductory note does have the benefit of explaining something of the interpretation of the music: why director John Southcott chose the instruments featured on the disc and, again very briefly, what factors he took into consideration when coming to the renditions presented here. 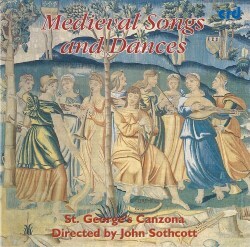 Works featured on this disc range from the late twelfth-century French troubadour pastourelle L’autrier m’iere levaz, through works from the thirteenth-century Cantigas de Santa Maria and English thirteenth-century songs, to the opening and closing works, Lamento di Tristano and Tre fontane, both fourteenth-century Italian pieces. Most, if not all, of the pieces presented here will be familiar to lovers of early music. They appeared on a number of discs since the release of these crd discs. These are nevertheless very good recordings of the works, fresh and full of vitality and conviction. The performance style is generally fairly rude and rustic, which of course suits the music perfectly. The performers bring out well the various moods of the works, from raucous and celebratory through to tender and beautiful. Merry it is while Summer lasts features more English works than the Mediaeval Songs and Dances disc. The date ranges, however, are the same as on the previous disc, as is the performance style and, indeed, the performers producers and engineers. Counter-tenor Derek Huddson is a little more Blackadderish in the opening Kalenda maya than one finds in his performances in the Mediaeval Songs and Dances disc, but only for this particular work. That was, presumably, because it was deemed that this particular troubadour song demanded such a style. Included on the disc are songs from the Northern French Trouvere tradition, anonymous istampitas, a German Minneleid, Italian ballads of the fourteenth-century, and traditional English songs and dances, including two Morris dances. Performances are again pleasing, with strong rhythmic drives, and great sensitivity shown to the mood of the work in question. 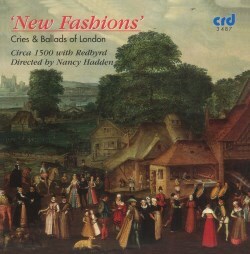 New Fashions – Cries & Ballads of London was recorded quite a bit later, in 1991, and features different artists: Red Byrd and Circa 1500 directed by Nancy Hadden. It opens with Thomas Ravenscroft’s New Oysters, here in an atmospheric and vivid rendition, especially given the effect produced: the artists, from a very distant and quiet beginning, approach closer to the microphone. The same work concludes the disc, appropriately enough with the performers walking away from the microphone and fading into the distance. The pieces by the likes of Ravenscroft, Anthony Holborne, Christopher Tye and Thomas Weelkes are very well-performed indeed and together form an excellent disc. It is a good combination of the more raucous street cries, or works based thereon, and more refined and elegant music for viols. The booklet presentation yet again leaves something to be desired, with an extremely grainy black and white photograph of the performers on the inside, and a musical quotation actually written out in hand rather than printed. Notes are only just slightly more extensive than in the previous discs, and there are no artist biographies at all, although texts are again present. All three discs can therefore be recommended, as long as one can overlook the outdated presentation and slightly unprofessional appearance of the booklets.